There was lots of interest in this M 5.3 earthquake offshore of Ventura/Los Angeles, justifiably so. Southern California is earthquake country. Here is an update. There was lots of information that I was trying to incorporate and I needed an additional report to cover some of this material. That being said, there is still some mystery about this earthquake. My favored interpretation is that this EQ was a left-lateral strike-slip earthquake. There is still room to interpret this as a right-lateral strike-slip (llss) earthquake however. Below I have prepared some figures that provide additional information that helps us learn about the faulting and basin development in the CA Borderlands here. There is lots of work that has been done here and this is far from a comprehensive analysis. As I mentioned before (here is my initial Earthquake Report for this EQ), due to the big bend in the San Andreas fault (SAF) in southern CA, there is evidence for compression in the form of thrust faults and uplifted mountains (e.g. Sierra Madre fault and the San Gabriel Mtns). One of these thrust faults (which may also have some strike-slip motion) is the Hollywood fault (recently highlighted by the recent work by the CA Geological Survey). Also part of the development of the SAF involved the clockwise rotation of a crustal block where the Transverse Ranges are (the mtns to the north of Ventura/Santa Barbara). Along the southern boundary of the Transverse Ranges formed left-lateral strike slip faults. The Santa Cruz Island fault just happens to be a left-lateral strike-slip fault. The CA Borderlands is a complex region of faulting, inheriting structures from the Tertiary, overprinted by modern tectonics and everything in between. The Hollywood fault trends towards (and turns into?) the Malibu Coast fault, which may turn into the Santa Cruz Island fault (SCIF), a vertical left-lateral strike-slip fault (but may have some vertical motion on it, based upon offsets in vertical uplift rates from marine terrace profiles). Schindler used seismic reflection profiles in the Santa Cruz Basin area to interpret the tectonic history here. I placed the faults interpreted by them as orange lines in the interpretive poster (labeled as the Ferrelo fault and the East Santa Cruz (ECS) Basin fault system). The ESCBFS is a thrust fault system, with possible oblique motion (strike-slip). My initial interpretation was that this M 5.3 was a llss earthquake associated with this fault. There are some interesting problems that arise considering this fault. To the south, the fault is oriented similar to the San Clemente fault (which may have had a M 5.5 right-lateral strike-slip (rlss) earthquake on 1981.09.04). Due to this, the simple interpretation is that the ESCBFS is right lateral oblique at the southern part of the Santa Cruz Basin. However, along the northern boundary of this basin, the ESCBFS rotates to an east-west strike (orientation). The simple interpretation would be that this part of the fault system would be llss, similar to the SCIF. So, clearly, things are not so simple here. See the Chaytor et al. (2008) figure below. That being said, if this M 5.3 earthquake was on an east-west fault, it would be llss. There is no evidence for a north-south oriented fault on the western boundary of the Santa Cruz Basin (see Schindler (2007) seismic profile below), supporting the left-lateral interpretation. I plot the seismicity from the past month, with color representing depth and diameter representing magnitude (see legend). I include earthquake epicenters from 1918-2018 with magnitudes M ≥ 4.5. I plot the USGS fault plane solutions (moment tensors in blue and focal mechanisms in orange) for the M 5.3 earthquake, in addition to some relevant historic earthquakes (including the 1971 Sylmar and 1994 Northridge earthquakes, as evidence for the compression in the region). In the upper left corner is a cross section from Shaw and Suppe (1994). This cross section location is shown on the interpretive poster as a blue line labeled X-Y. This cross section (from interpretations of offshore seismic reflection profiles) shows the major player here is a thrust fault, the Channel Islands Thrust. Note the SCIF is also shown to rip right through Santa Cruz Island. 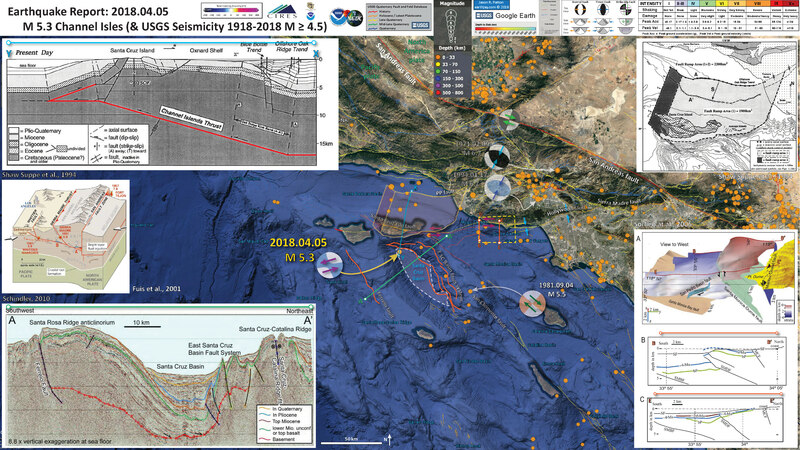 In the upper right corner is a map that shows the area of this fault ramp of the Channel Islands Thrust (Shaw and Suppe, 1994). Note that this fault ramp area is also shown on the interpretive poster, outlined in light orange. In the center left is a figure from Fuis et al. (2001) that shows a block diagram revealing how the north-south convergence (from the bend in the San Andreas) is accommodated by thrust/reverse faults. The Sierra Madre fault is also labeled on the interpretive poster. A recent earthquake in La Habra is an example of this north-south compression. Here are my report and report update for this M 5.1 La Habra earthquake. In the lower left corner is a seismic reflection profile from Schindler (2007), from her Master’s Thesis. The profile A-A’ is shown on the map as a green line labeled A-A’. Note that there is no faulting on the western boundary of the Santa Cruz Basin. When I first looked at this section, I thought that the ESCBFS were either normal (extensional) or strike-slip faults. After reading her thesis, I learned that these faults did have normal offset (in the Miocene Epoch, part of the Tertiary Period), but have been reactivated as thrust faults in post-Miocene time. The San Clemente fault (labeled on the interpretive poster) turns into the Santa Cruz-Catalina Ridge fault (labeled on this cross section). In the lower right corner is a figure that shows how these faults interact in a complicated manner (Sorlien et al., 2006). This figure was prepared after they interpreted seismic reflection profile data. The upper panel is a low-angle oblique view of the faults in 3-D view. The lower two panels are the cross sections B-B’ and E-E’ (also shown on the interpretive poster as orange lines). These cross sections show how the Malibu Coast fault is more deeply dipping (more close to vertical) compared to the Santa Monica-Dume fault (a shallow dipping thrust fault). Both of these faults appear to join in some way near the coast, where they turn into the Hollywood fault. There are probably some inaccuracies in how I am interpreting how these faults interact beyond the limit of the figures I present here. Here is the same map including the magnetic anomaly data (the red and blue shades). Here is a map that shows where the seismic profile was acquired (Shaw and SUppe, 1994). Epicenters from an earthquake swarm in 1984 (Henyey and Teng, 1985) define the active axial surface (A) of the Offshore Oak Ridge trend. Single-event (C and D) and composite (E and F) focal mechanism solutions from the 1984 seismicity have gentle north dipping (C, D, and E) and horizontal (F) nodal planes (Henyey and Teng, 1985) consistent with folding through the active axial surfaces by bedding parallel slip (see Figure 10B). Cross section traces: X-X’ (Fig. 7); X-Y (Fig. 11). SCIF = Santa Cruz Island fault. Here is the cross section. The upper panel shows the modern configuration and the lower panel shows their interpretation during the Tertiary (Shaw and Suppe, 1994). A balanced geologic cross section across the eastern Santa Barbara Channel and Santa Cruz Island combines subsurface seismic reflection and well-log data (the section trace is in Figs. 1 and 10A). The Channel Islands thrust ramps beneath the Offshore Oak Ridge trend and approaches the surface south of Santa Cruz Island. The kink-band width (A-A’) of the Offshore Oak Ridge trend represents dip slip on the underlying Channel Islands thrust. The shallow fold and fault geometry along the Offshore Oak Ridge and Blue Bottle trends is depicted in Figure 7. Strike-slip motion out of the section plane may occur on the Santa Cruz Island fault; however, moderate displacements on this fault should not significantly effect our area balance and restoration, because the strike-slip fault trace is perpendicular to the section plane (Fig. 10A). SCIF = Santa Cruz Island fault. Horizontal equals vertical scale. For background, here is a timeline for the tectonics along the Pacific-North America plate boundary (Schindler, 2007). The Transverse Ranges block is shown as a green bleb labeled WTR. Note how this block is rotating in a clockwise fasion, and see that there are strike-slip faults that form along the block edge to accommodate this rotation. A simple tectonic model of the evolution of the Pacific-North American plate boundary that includes the Inner and Outer Borderland (IB, OB) and rotation of the western Transverse Ranges (WTR) province (from Nicholson et al, 1994). The model assumes a constant rate and direction of Pacific plate motion and constant rate of western Transverse Ranges rotation. As each partially subducted microplate is captured by the Pacific plate (Monterey, ~19 Ma; Arguello, ~17.5 Ma; Guadalupe and Magdalena, ~12 Ma), this results in a transfer of part of the over-riding North American upper plate to the Pacific plate. The fine gray lines provide a reference grid fixed to North America. ArP-Arguello plate; GP-Guadalupe plate; MtP-Monterey plate; SG-San Gabriel block; JdFP-Juan de Fuca plate; SLB-San Lucia Bank; SMB-Santa Maria basin; SB-southern Borderland;T-AFTosco- Arbreojos fault; MP-Magdalena plate. Red areas are regions of transtension; Purple areas are captured or soon to be captured microplates. Here is the seismic reflection profile from Schindler (2010). Regional seismic line WC82-108 showing the ~50 km wide Santa Rosa Ridge anticlinorium. Parallel bedding of pre-Pliocene strata indicates that this anticlinal structure formed post Miocene. The Cretaceous-Paleogene sedimentary rocks are eroded by the early Miocene unconformity (green) and truncate against basement (black arrows). Mapped reference horizons and faults are shown in color and in black, respectively. This is a fantastic low-angle oblique view of the topography and bathymetry of this region (and the Santa Cruz Basin) from Schindler (2010). The figure caption is embedded in the figure. This is the figure from Schindler (2010) that shows the geometry of the ESCBFS and Ferrlo faults. Red shows the upper part of the faults. These faults dip to the north, northeast, and east. A map view of 3D fault surfaces surrounding Santa Cruz basin in the northern Borderland. Depths down-dip along fault surfaces are shown as changing colors at even kilometer levels. The ESCB fault system is observed to be a gently east- to northeast-dipping, right stepping, en echelon reactivated reverse or oblique-reverse fault that bends to become more northerly dipping as it approaches Santa Cruz Island. There has been lots of work here. Jason Chaytor (now at USGS in Woods Hole) worked on submerged marine terraces in this region. These marine terraces were formed when sea level was lower and are a result of erosion from ocean waves at that time. Dr. Chaytor used radiometric ages and sea level curve data to evaluate the tectonic uplift in the region. Here is a map that shows Jason’s interpretation of the seismic profiles for this region (same seismic data used by Schindler). Preliminary map of geologic structures currently mapped using multichannel sparker, and recently released WesternGeco multichannel seismic-reflection profiles (modified from Chaytor, 2006). SCIF—Santa Cruz Island fault. Legg, M. R., M. D. Kohler, N. Shintaku, and D. S. Weeraratne, 2015. Highresolution mapping of two large-scale transpressional fault zones in the California Continental Borderland: Santa Cruz-Catalina Ridge and Ferrelo faults, J. Geophys. Res. 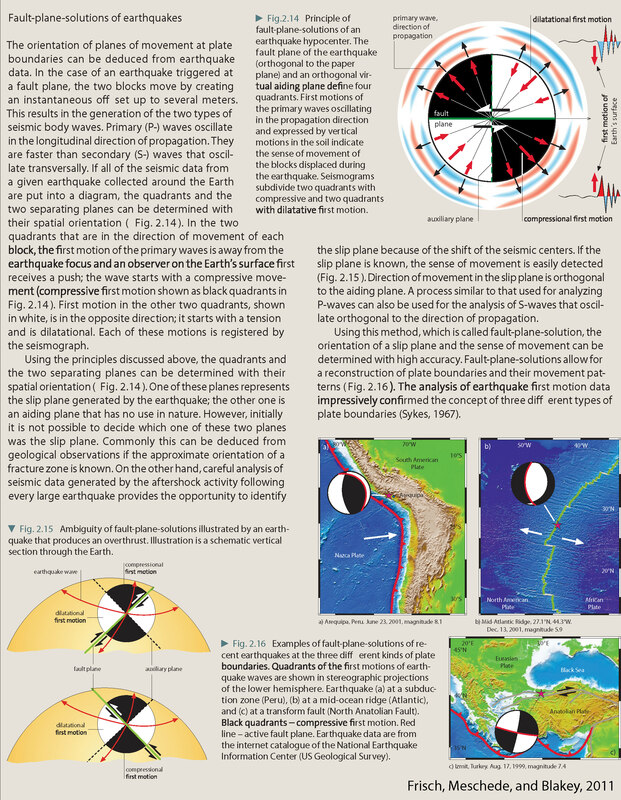 Earth Surf., 120, 915–942, doi:10.1002/2014JF003322.